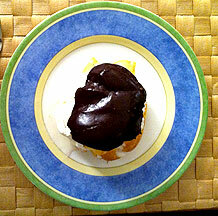 Dance classmate Betty's cream puff recipe will have your taste buds tap-dancing with delight. Place your whipping cream bowl and beaters into the freezer. Preheat oven to 400 degrees. Bake at 400 degrees for 20 minutes or until lightly browned. Turn off oven and allow puffs to sit for another 10 minutes. Make small slits in the side of each puff to allow steam to escape. Set aside to cool. Cut in half crosswise, fill with cream custard, whipped cream or a combination and replace tops. Beat your whipping cream in the pre-frozen bowl. Betty adds 1 1/2 tablespoons of powdered sugar plus a teaspoon of vanilla to every pint of whipping cream. Another option is to make instant custard for your filling. Betty sometimes uses a combination of both whipped cream and custard.